Many wars and battles raged in Zululand, an area north of Durban and south of Johannesburg. Many people who visit South Africa, forget to stop in the Battlefield region, but for those interested in the culture and history of the country, the Battlefields really are a must see destination! Vast grasslands and rolling hills dotted with traditional Zulu homesteads make for impressive and inspiring scenery, and the actual battle sites with their museums and interpretive displays really have a story to tell. Three parties fought the battles and wars that occurred here: the Zulus, the British and the Boers/Voortrekkers from Dutch descent. Monuments, interpretive visitor centers and open-air museums now stand at the sites of these battles, helping you learn about and relive the battles. The four most significant battles are explained in more detail below. Which battlefields you include in your tour depend on you and your preferences. You can of course visit them all, but this will take 2 full days and 3 nights. Blood River and Talana can be visited together in one day and Isandlwana and Rorke's Drift on another day. As the battlefields and monuments lie at the end of long dusty dirt roads timing is everything, and it is not realistic to try and visit one of the sites on the afternoon of arrival or morning of departure. Card which indicates the locations: Johannesburg (blue) , Drakensberg (green), Battlefields Zululand (yellow) and the Elephant Coast (red). In 1838 the battle at Blood River was thrashed out between the Zulus and the Voortrekkers (farmers). This battle was the result of the large farmers migration North into the interior of South Africa from the Cape Region. The Voortrekkers leader Piet Retief hoped that they would find land that they could settle on in the Natal Coastal Plain. During negotiations, the Zulus, however, killed Piet Retief and all his men. The Voortrekkers swore revenge, which led to the Battle of Blood River a year later. Between 10,000-15,000 Zulus fought a clutch of only 462 Voortrekkers. 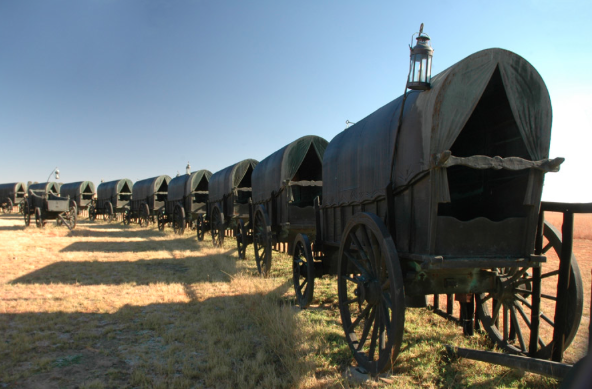 The Voortrekkers protected themselves in the middle of a circle of ox wagons. Tactical but intensive defense allowed the Voortrekkers to defeat the Zulu army, killing over 3000 Zulus. The Voortrekkers walked away with only 4 injured men. The 64 life-size ox wagons, replicas of the originals, make a distinct impression at the battle site, and are definitely worth visiting. The farmers used them to help defend themselves against the Zulus, and standing next to the replicas give you a real impression of how things played out during the battle. A passionate historian will tell you in detail how the battle played out. You can choose to have an English or Zulu guide. Both speak English, however, the one tells the story from a ‘Voortrekker’ point of view and the other from the Zulu perspective. This provides interesting differences! You can also visit the two museums where you can learn more; there is no entrance fee. The Battle of Talana took place in 1899 between the Boers and the British. This was the first major confrontation of the Second Boer War. The battle was fought on the 1,442-meter high Talana Hill. You get an impressive experience of this battle at the Talana Museum housed in an old building on the hill. The museum breathes history and is informative and well organized which makes your visit definitely worthwhile. 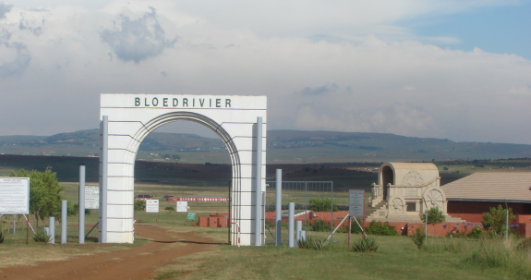 You can visit this site on the same day the Battle of Blood River tour. When visiting the Battlefields of Zululand the battle of Isandlwana is one of the most important in history. The British declared war on the Zulus as the Zulu king had rejected the British ultimatum. This battle was fought in 1878. It is noteworthy that during this battle the Zulu warriors massacred the British, who were virtually invincible at the time. No wonder maybe, as close to about 20.000 Zulus engaged only 1800 British men. The Zulus however were ‘only’ armed with spears and cow hide shields, whereas the British all had good rifles, and even two 7-pounder mountain guns and a rocket battery. Both parties suffered heavy losses, more than a 1000 men each. During your stay you can visit a nearby museum and the monument of the perished warriors at Isandlwana. This takes you back to an important piece of history of South Africa. A historian can bring this fateful day for the British alive. 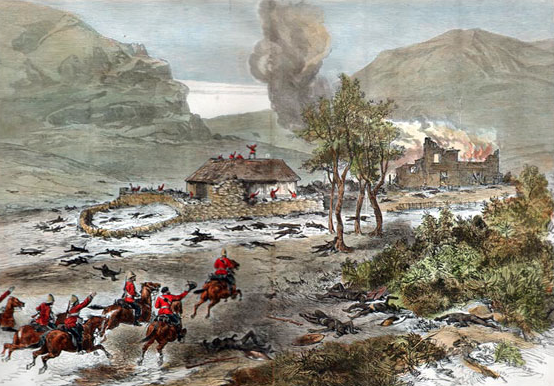 The defense at Rorke's Drift immediately followed the defeat of the British at the Battle of Isandlwana. Around 139 British soldiers had to defend Rorke’s Drift against approximately 5000 Zulu warriors. The British, however, held the Zulus off for 12 very long hours. Eventually out of sheer exhaustion, the Zulus broke off the attack. 500 Zulus lost their lives; the British lost 17, although every single one of the British had sustained one or more injuries. This victory is entered in the record books as one of the bravest British defenses ever. The museum and the site itself provides a good picture of this bloody battle and take you back in time. This battlefield can be visited as part of a day tour with Isandlwana. The Battlefields of KwaZulu-Natal are an impressive destination to choose on your journey through South Africa. You can easily combine this with one of our other trips in the region. For instance with the "Elephant Coast (270 km / 3.5 hours) or the 'Drakensberg' (180km / 2.5 hours). But if you would like to stay longer in the Battlefields this can of course also be arranged. From Johannesburg the Battlefields are 370km / 4.5 hours away. At Isibindi Zulu Lodge the designers have been inspired by tradional Zulu culture. The six cabins are designed like Zulu rondavel houses, but with 4-star luxury. Each rondavel is tucked away in the peaceful garden allowing guests the privacy to enjoy the beautiful Isibindi Eco Reserve from their private viewing deck. Lovely views of the reserve can also be enjoyed from the infinity pool at the main lodge. Every morning a battlefield tour departs from the lodge visiting the sites of the Isandlwana and Rorkes Drift battles. A guide is provided to explain the fascinating past of the area. The lodge offers many other activities in the area such as game drives and a Zulu cultural experience. Children of all ages are welcome at the Isibindi Zulu Lodge. Rorkes Drift Lodge is a 3-star accommodation located at the heart of KwaZulu-Natal. The lodge is surrounded by 1000 ha private property that is inhabited by an array of wildlife. All en-suite rooms are tastefully furnished and spacious, with comfort in mind. Guests can enjoy their breakfast on the deck, whilst admiring the beautiful view over the plains of Zululand. Battlefield tours depart from the lodge on a daily basis. Children of all ages are welcome at Rorkes Drift Lodge. Penryn Guesthouse is a stately old house in the middle of Dundee that has been transformed into a cosy 4-star guesthouse. Penryn offers a family flat which can sleep 4 people; this flat has small lounge and fully equipped kitchen. The other rooms are all en-suite and have private entrances. The property is surrounded by a beautiful rose-filled garden where guests can relax after a long day. Dundee lies in the very heart of the KwaZulu-Natal Battlefields. Children of all ages are welcome at Penryn Guesthouse.